They say that it’s a harmless hobby – less harmful than cigarettes; that it is non-addictive and safe even for pregnant women. All of these myths are false. The nargila is no less of a health danger than cigarettes – sometimes even more so. The Nargila is now considered a normative social activity, in particular among teens. 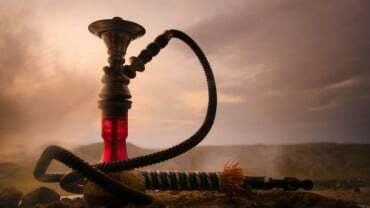 A recent Israeli survey found that 33.3 percent of Israeli youth have experimented with nargila smoking vs. 20.1 percent who have tried cigarettes. Many consider nargila smoking a safe hobby, But, what do we really know about nargila smoking? Reality check – Here is some important myth shattering information regarding nargila smoke. Myth: Fruit flavored nargila is tobacco free. Fact: A Nargila is a water-pipe used to smoke flavored tobacco. Sample flavors include apple, mint, cherry. Because of the fruity flavors, many youth mistakenly think that this nargila smoke is tobacco-free. Fact: Nargila smokers absorb three times more nicotine than cigarette smokers. Total toxins absorbed via nargila smoke are ten times higher than the amount of toxins absorbed via cigarette smoke. We assume that these results are because of the extended duration of the “smoke”, which in the case of nargila smoking can last between 30 minutes to hours. In addition, Nargila tobacco is not controlled by the Ministry of Health. Manufacture statements regarding contents are not reliable and often written in a language unknown to user. Fact: Women exposed to active (first-hand) or passive (second-hand) nargila smoke gave birth to children with lower birth-weight and increased respiratory disorders than babies born to women unexposed to nargila smoke. Low birth weight can be a negative influence on a child’s health and developmental status. Benzopyrene -A known carcinogen, especially for lung and skin cancers. It can also undermine human fertility. Carbon Monoxide – a poisonous gas. It has no smell or taste. The body finds it hard to differentiate carbon monoxide from oxygen and absorbs it into the bloodstream. In high quantities, it can cause you can go into a coma and may even be lethal. In case you need more convincing – In a recent study conducted in Southern Israel, to examine driver alertness, it was found that drivers who had inhaled nargila smoke prior to their journey were less alert. They had elevated levels of carbon monoxide in their blood – a factor that increases disorientation and reduces alertness. Following inhalation of Narghila tobacco, drivers were found to have an accident risk rate 33% higher than non-smokers. Point to Ponder: Passive Nargila smokers are at higher risk of disease than passive cigarette smokers because of the added effect of charcoal compounded with tobacco consumption. Bottom Line – Nargila smoke is as dangerous as other types of smoke – in some cases it is even more dangerous. It is not a healthy alternative to cigarette smoke. We must shatter the conception that a nargila smoke is acceptable!